Somehow, I’ve been in Berlin for 6 1/2 years and I still don’t have a library card. It makes sense, because books and DVDs are so cheap here, and there’s a wide variety of material available online legally for free (public domain things, samplers, swaps, etc). But I felt it was time. 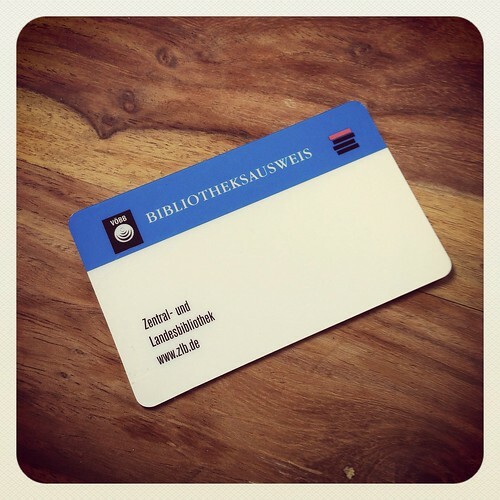 I headed over to Breite Strasse to register for the Zentral- und Landesbibliothek Berlin and got my card. I’ll likely be going to the American library in Kreuzberg, because the one on Breite Strasse doesn’t really have the right collections (I’m more looking for fiction, DVDs and CDs). I may also mosey on over to the Bibliothek am Wasserturm as well, because even though they have a much, much smaller selection, it’s closer. Yes, there are a lot of different libraries here (luckily you just need one card). Want to join the library? They’re everywhere! Just show up with your registration info and ID and say you want to register. It cost me 5 Euros for one year as a student, and I don’t think it’s much more for the regular price.